Alcohol consumption inhibits accessory cell function and Ag-specific T cell responses. 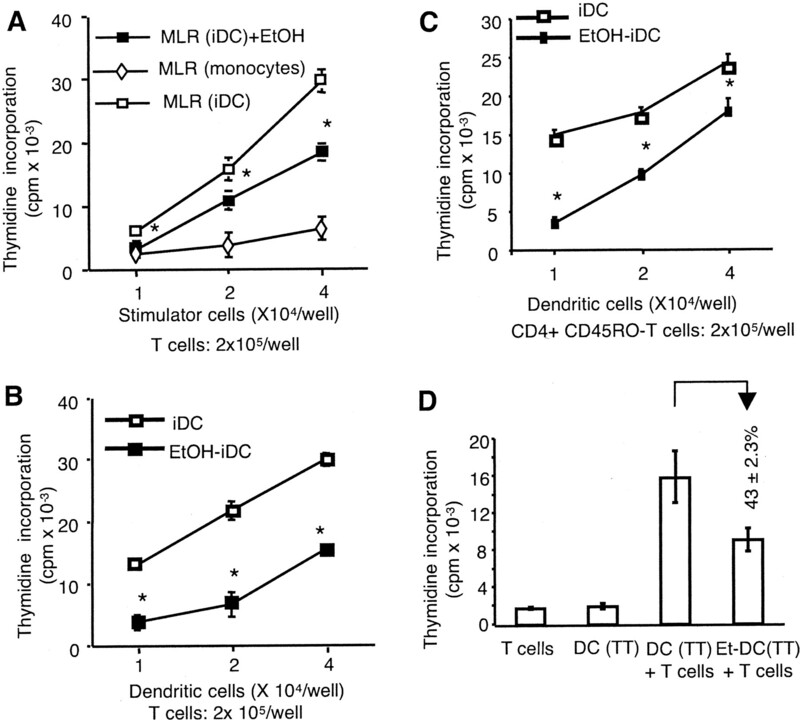 Myeloid dendritic cells (DCs) coordinate innate immune responses and T cell activation. In this report, we found that in vivo moderate alcohol intake (0.8 g/kg of body weight) in normal volunteers inhibited DC allostimulatory capacity. Furthermore, in vitro alcohol treatment during DC differentiation significantly reduced allostimulatory activity in a MLR using naive CD4+ T cells, and inhibited tetanus toxoid Ag presentation by DCs. Alcohol-treated DCs showed reduced IL-12, increased IL-10 production, and a decrease in expression of the costimulatory molecules CD80 and CD86. Addition of exogenous IL-12 and IL-2, but not neutralization of IL-10, during MLR ameliorated the reduced allostimulatory capacity of alcohol-treated DCs. Naive CD4+ T cells primed with alcohol-treated DCs showed decreased IFN-γ production that was restored by exogenous IL-12, indicating inhibition of Th1 responses. Furthermore, CD4+ T cells primed with alcohol-treated DCs were hyporesponsive to subsequent stimulation with the same donor-derived normal DCs, suggesting the ability of alcohol-treated DCs to induce T cell anergy. LPS-induced maturation of alcohol-treated immature DCs partially restored the reduced allostimulatory activity, whereas alcohol given only during DC maturation failed to inhibit DC functions, suggesting that alcohol primarily impairs DC differentiation rather than maturation. NFκB activation, a marker of DC maturation was not affected by alcohol. Taken together, alcohol both in vitro and in vivo can impair generation of Th1 immune responses via inhibition of DC differentiation and accessory cell function through mechanisms that involve decreased IL-12 induction. Excessive alcohol use can be linked to direct immunomodulatory effects that include reduced T cell-proliferative responses and impaired delayed-type hypersensitivity responses (1, 2, 3, 4, 5, 6). Alcohol modulates Ag-specific T cell proliferation by affecting APC function. Our laboratory has reported significant reduction in the Ag presentation function of human monocytes upon in vitro alcohol treatment in tetanus toxoid (TT)4- and superantigen-induced T cell proliferation assays (7, 8, 9). Considering that monocytes are precursors of Ag-presenting dendritic cells (DCs), it is probable that alcohol may affect immune functions by affecting monocyte differentiation into DCs. Myeloid DCs, one of the most potent APC types in vivo, represent a terminally differentiated stage of monocytes (10, 11). DCs express various costimulatory and/or adhesion molecules, produce regulatory cytokines, and activate naive T cells in a primary antigenic response (10). Thus, DCs are pivotal in regulation of the cytokine environment for T cell activation. 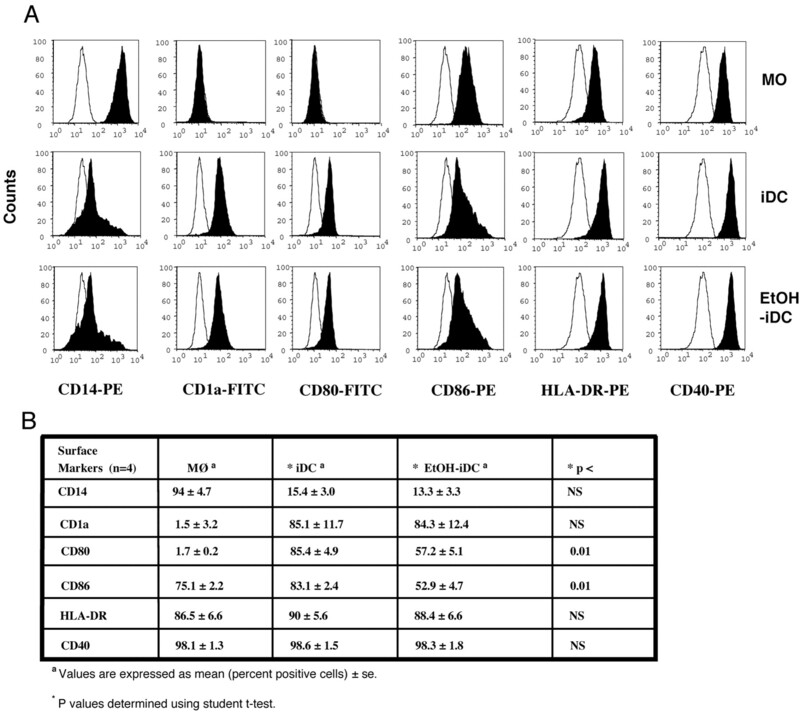 Blood monocytes cultured in vitro with GM-CSF plus IL-4 differentiate into nonadherent CD1a+CD14low/− immature DCs (iDCs) defined by extremely low CD83 expression (12, 13). These iDCs show a high ability for Ag uptake and low capacity for Ag presentation. Pathogen-related molecules such as LPS, bacterial DNA, and inflammatory cytokines stimulate maturation of DCs and their subsequent migration to lymphoid organs where they present Ags to T cells. This conversion from an Ag-capturing iDC to an Ag-presenting mode is defined as DC maturation (11, 13). Production of cytokines such as IL-12 during the maturation process promotes DC induction of Th1 responses (14). In contrast, IL-10 has been identified as the major cytokine that can prevent both differentiation of DCs from monocytes and maturation of DCs by blocking release of IL-12 (15). IL-10 also inhibits expression of costimulatory molecules and, consequently, inhibition of Th1 responses (16). Thus, autocrine IL-10 production can prevent maturation of DCs and, as a result, induce anergy in responder T cells (17). Our earlier studies have shown significant inhibition of Ag-presenting function and increased IL-10 production after acute alcohol treatment of the DC precursors, monocytes (7, 8, 18). Furthermore, DC-based therapeutic approaches are being proposed in several diseases such as hepatocellular carcinoma wherein chronic alcohol exposure is a major risk factor (19, 20). Therefore, if alcohol suppresses DC function, it would probably have an adverse effect on their therapeutic efficacy. In the present study, we assessed the effects of in vivo alcohol consumption and in vitro alcohol treatment on myeloid DC differentiation and maturation. We found that in vivo and in vitro alcohol treatment primarily affected DC allostimulatory responses, inhibited Th1 activation, and induced T cell anergy. This was linked to reduced IL-12 levels, because exogenous IL-12 restored the defective DC allostimulatory capacity and Th1 responses. IMDM and RPMI 1640 medium were obtained from Invitrogen Life Technologies (Gaithersburg, MD) and FBS (Defined) from HyClone (Logan, UT). Endotoxin contamination was <8 pg/ml in the culture medium and FBS. LPS (Escherichia coli strain 0111:B4) was from Difco Laboratories (Detroit, MI) and NFκB oligonucleotide was obtained from Oligos Etc. (Wilsonville, OR). Dexamethasone and protease inhibitors including PMSF, aprotinin, antipain, and leupeptin were from Sigma-Aldrich (St. Louis, MO). Healthy individuals, aged 18–60, females and males, donated 120 ml of peripheral blood for in vitro experiments. Blood donors had no previous chronic alcohol abuse history, consumed <6 drinks/wk for females and <9 drinks/wk for males, and had no alcohol for at least 48 h before blood donation. Blood was obtained by venipuncture and anticoagulated by heparin. Alcohol use habits of blood donors for the in vivo studies were determined by a health assessment questionnaire that incorporates the AUDIT and CAGE tests and Health Screening survey to identify frequency and quantities of their alcohol use (21). Alcohol was given as 2 ml/kg of body weight (0.85 g/kg) vodka diluted with orange juice to a total volume of 300 ml, and it was consumed within 30 min. Blood alcohol levels were determined using an intoximeter Alcosensor III (Intoximeter, St. Louis, MO). Blood samples (50 ml) were obtained 30 min before alcohol consumption and 24 h after the alcohol uptake. The study was reviewed and approved by the Institutional Committee for Protection of Human Subjects in Research. Myeloid DCs were generated from peripheral blood monocytes, as described before (22, 23), of healthy volunteers and in vivo alcohol-consuming volunteers before (0 h) and after (24 h) alcohol consumption. Briefly, PBMC were generated by density gradient centrifugation on Ficoll-Hypaque (Pharmacia, Uppsala, Sweden), resuspended in RPMI 1640 (Invitrogen Life Technologies) containing 15% FBS, and then plated in six-well plates to ensure adherence. After 2 h at 37°C, nonadherent cells were removed, and adherent cells were cultured in 3 ml of RPMI 1640 containing 10% FBS and 0.1% 2-ME with GM-CSF (100 U/ml) and IL-4 (200 U/ml) (PeproTech, Rocky Hill, NJ) to induce DC differentiation. Alcohol (ethanol (EtOH)) (25 mM) was added along with the GM-CSF and IL-4 where indicated. The 25 mM in vitro alcohol concentration is physiologically relevant and is equivalent to a 0.1 g/dl blood alcohol level, which is achieved in vivo after a dose of moderate drink. DC cultures with alcohol were kept in modular chambers (Billups-Rothenberg, Del Mar, CA) where alcohol concentration was maintained at 25 mM throughout the 7-day incubation period. On days 3 and 5, 1 ml of supernatant was removed and replaced with the same volume of fresh medium containing half the initial concentrations of GM-CSF (50 U/ml), IL-4 (100 U/ml), and alcohol (12.5 mM) wherever indicated. iDCs generated were harvested by gentle scraping after 7 days of culture and used for subsequent experiments. To obtain mature DCs (mDCs), LPS (100 ng/ml) was added to iDCs on day 5 and harvested after 72 h.
Human T lymphocytes were purified from PBMCs of healthy nonalcoholic individuals using the T cell negative isolation kit from Dynal (Great Neck, NY) (24). The purity of this T cell population was 98% as determined by CD3 expression by FACS analysis. Subsequently, naive CD4+ T cells were negatively selected from total T cells with anti-CD8 mAb in combination with CD45RO mAb (both from BD Pharmingen, San Diego, CA) plus goat anti-mouse IgG-conjugated immunomagnetic beads (Dynal). These T cell preparations were 98% pure CD4+ as determined by FACS analysis (24). DCs were incubated with saturating concentrations of fluorochrome-conjugated mAbs at 4°C for 30 min, and then washed twice in PBS containing 2% FBS and fixed in 1% paraformaldehyde. Data were collected using a FACScan II flow cytometer (BD Biosciences, San Jose, CA), and data analysis was performed using FlowJo software (BD Biosciences). The following fluorochrome-conjugated mouse mAbs against human cell surface proteins were used for DC surface marker staining: FITC-conjugated anti-CD1a, PE-conjugated anti-CD14, FITC-conjugated anti-CD-80, FITC-conjugated anti-CD-86, FITC-conjugated anti-CD-40, FITC-conjugated CD83, and PE-conjugated anti-MHC class II Abs (obtained from BD Pharmingen). The FITC- and PE-conjugated anti-IgG1 isotypic controls obtained from BioSource International (Camarillo, CA) and BD Pharmingen were run as controls. One-way MLR was set up in 96-well, flat-bottom microculture plates as described before (9, 25) (Corning Glassware, Corning, NY). DCs (stimulator cells) were then added to allogeneic purified CD4+CD45RO− T lymphocytes (responder cells) at 105 cells/well at varying ratios in triplicate wells. The final volume of each well was adjusted to 200 μl with RPMI 1640 containing 10% FBS and 0.1% 2-ME. Cultures were maintained for 5 days. Cytokines or anti-cytokine Abs were added at the initiation of the MLR where indicated, including the following: human rIL-12 (PeproTech) added at 0.5, 10, or 50 ng/ml; IL-2 at 50 U/ml (R&D Systems, Minneapolis, MN); neutralizing Abs for IL-10 (BioSource International) at 10 μg/ml; or rat IgG1 as control. One microcurie of [methyl-3H]thymidine (DuPont-NEN, Boston, MA) was added to each well during the last 18 h, and thymidine incorporation was quantitated by liquid scintillation counting. Results were expressed as mean counts per minute ± SE. The Ag presentation assay was performed as described earlier (7). Briefly, iDCs were pulsed on day 6 with 2 Lf/ml TT (Massachusetts Biological Laboratory, Boston, MA) overnight. Ag-pulsed and unpulsed DCs (1 × 105 per well) were collected, combined with autologous T lymphocytes at a 1:6 DC:T cell ratio, and incubated for a total of 6 days, and T cell proliferation was assessed by [3H]thymidine incorporation during the last 18 h. Results were expressed as mean counts per minute ± SE. Apoptotic cells were detected using the Annexin VFITC kit (BioSource International). Briefly, a total of 2 × 105 DCs or T cells after coculture with DCs in an MLR was incubated with 5 μl of Annexin VFITC and 10 μl of propidium iodide (PI) in binding buffer for 15 min. Early apoptotic cells (Annexin V positive), late apoptotic cells (Annexin V positive and PI positive) and necrotic cells (PI positive) were quantitated by FACS (BD Biosciences) analysis. The levels of IL-12 (p40/p70), IL-10, IFN-γ, and IL-2 in the DC, MLR, and T cell supernatants were measured using ELISA kits purchased from Endogen (Cambridge, MA) according to the manufacturer’s instructions. To induce maximal cytokine production in iDCs, day 7 DCs were stimulated with LPS (100 ng/ml; Difco Laboratories), and supernatants were collected after 18–20 h. MLR supernatants were also collected on day 3 for cytokine measurements. Human naive CD4+ (105) T cells were primed with irradiated allogeneic normal DCs (104) or alcohol-treated DCs (104) for 3 days, and then CD4+ T cells were negatively selected with anti-human CD11c mAb (BD Pharmingen) plus goat anti-mouse IgG mAb-conjugated immunomagnetic beads. These T cell preparations contained <0.1% CD11c+ cells as assessed by FACS analysis. To assess suppressor activity of anergic T cells in the alloantigen-specific system (24), day 3 CD4+ T cells (105) were subsequently restimulated with allogeneic normal iDCs and mDCs (104) generated from the same donor in triplicate. The proliferative response was measured by adding 1 μCi of [methyl-3H]thymidine (DuPont-NEN) to each well during the last 18 h, and thymidine incorporation was quantitated by liquid scintillation counting. Results were expressed as mean counts per minute ± SE. To assess T cell IFN-γ production, day 3 T cells after coculture with the EtOH-treated or normal DCs were harvested, purified, and plated onto CD3 plates (BD Collaborative, Medford, MA) with soluble CD28 (1 μg/ml), and IFN-γ was assayed by ELISA after 18 h.
To determine NFκB activation, nuclear extracts from day 5 DCs with or without stimulation (LPS, 100 ng/ml) for 1, 24, 48, and 72 h were prepared by the method of Schatzle (26) as we previously described (27). Briefly, a consensus double-stranded NFκB oligonucleotide (5′-AGTTGAGGGGACTTTCCCAGGC-3′) was used for EMSA by end labeling the oligo using T4 polynucleotide kinase in the presence of [γ-32P]ATP (DuPont-NEN). Labeled oligonucleotides were purified on a polyacrylamide copolymer column (Bio-Rad, Hercules, CA). Five micrograms of nuclear protein was subjected to electrophoretic mobility gel shift analysis as previously described (27). Statistical significance between appropriate groups was calculated from experiments done with the same experimental condition using the Wilcoxon signed-rank nonparametric data analysis. Data are represented as mean ± SE. Decreased cell-mediated immunity in animal models of chronic alcohol consumption was linked to abnormal Ag-presenting function (28). Previous studies from our laboratory have shown inhibition of accessory cell function in human monocytes after in vivo and in vitro acute alcohol administration (7, 29). In this study, we tested the influence of moderate alcohol consumption (0.8 g of alcohol/kg of body weight) in eight nonalcoholic healthy individuals on the Ag-presenting capacity of DCs. Peak blood alcohol levels were reached 30–60 min after alcohol intake and averaged close to the legal limit (mean, 0.093 ± 0.02 g/dl; range, 0.08–0.15 g/dl). Monocytes were isolated before and 24 h after consumption of alcohol and differentiated in vitro into iDCs in the presence of IL-4 plus GM-CSF. There was no alcohol added in vitro. Fig. 1⇓ shows that DCs generated from monocytes after alcohol intake exhibited a significantly decreased allostimulatory capacity compared with DCs of the same individual from cells obtained before alcohol consumption (p < 0.005; n = 8). These results suggested that a single, acute, moderate alcohol intake was sufficient to impair accessory cell function of DCs. In vivo alcohol consumption decreases allostimulatory activity of DCs. DCs were generated before (□) and after (▪) consumption of 0.8 g/kg of body weight of alcohol. Day 7-irradiated iDCs (iDC) (stimulators) were cocultured with allogeneic T cells (responders) at various stimulator:responder cell ratios of 1:20, 1:40, and 1:80 in triplicate. [3H]Thymidine incorporation was assessed during the final 18 h of the 5-day MLR. Results are expressed as mean counts per minute ± SE from eight donors. ∗, p < 0.005. Having observed the in vivo effects of alcohol on DC function, we evaluated the mechanisms affected by alcohol during T cell proliferation, DC differentiation and maturation. First, the effect of a physiological dose of alcohol was tested on in vitro alloantigen-induced T cell proliferation in a MLR using iDCs as stimulator cells. Consistent with the greater accessory cell function of DCs compared with monocytes, the proliferation of allogeneic T cells was greater in the presence of day 7 iDCs generated in vitro with IL-4 plus GM-CSF than in the presence of day 7 monocytes (Fig. 2⇓A). Addition of alcohol at the initiation of the MLR with iDCs significantly reduced the degree of alloantigen-induced T cell proliferation (p < 0.002, n = 10) (Fig. 2⇓A). The 25 mM in vitro alcohol concentration approximated blood alcohol levels (0.1 g/dl) that were reached after alcohol consumption in the in vivo experiments above. DC Ag presentation capacity is impaired by alcohol when added to the MLR (A), added during DC generation in vitro using total T cells in an MLR (B), added during DC generation in vitro using naive CD4+ T cells in an MLR (C), and in a specific Ag presentation assay against recall Ag TT (D). A, Alcohol treatment during the MLR. Stimulator day-7 iDCs cocultured with responder allogeneic T cells in a 5-day MLR in the presence (▪) or absence (□) of 25 mM alcohol in vitro. Freshly prepared monocytes from a normal donor were also used as stimulator cells in the MLR (⋄). [3H]Thymidine incorporation was evaluated and expressed as mean counts per minute ± SE from 10 donors. ∗, p < 0.002. B, MLR with alcohol-treated DCs. iDCs generated for 7 days in the presence (EtOH-iDC) (▪) or absence (iDC) (□) of 25 mM alcohol were cocultured with responder allogeneic T cells on day 7. [3H]Thymidine incorporation was evaluated during the final 18 h of the 5-day MLR. Results are expressed as mean counts per minute ± SE from 10 donors. ∗, p < 0.005. C, MLR with alcohol-treated DCs and naive T cells. iDCs generated for 7 days in the presence (EtOH-iDC) (▪) or absence (iDC) (□) of 25 mM alcohol were cocultured with responder naive CD4+CD45RO− cells on day 7. [3H]Thymidine incorporation was evaluated during the final 18 h of the 5-day MLR. Results are expressed as mean counts per minute ± SE from three donors. ∗, p < 0.01. D, TT Ag presentation by alcohol-treated DCs. iDCs generated in the presence (EtOH-iDC) or absence (iDC) of 25 mM alcohol were then pulsed with TT Ag overnight and then cocultured with syngeneic T lymphocytes for 5 days. Ag-specific T cell proliferation (counts per minute) is represented as the T cell proliferation in the presence of TT-pulsed DCs minus T cell proliferation in the presence of non-TT-pulsed DCs. Results are expressed as mean counts per minute ± SE from five donors. p < 0.05. Second, to investigate whether the decreased T cell proliferation in the presence of alcohol in the MLR was due to alcohol-mediated modulation of DCs, T cells, or both, we generated DCs in the presence or absence of alcohol for 7 days. We found that the morphological appearance and viability of DCs was not altered by the presence of 25 mM EtOH over the 7-day period of DC generation (data not shown). Allostimulatory capacity was significantly reduced (p < 0.005; n = 10) in immature day 7 DCs generated in the presence of 25 mM alcohol (Fig. 2⇑B). Furthermore, significant inhibition of allostimulatory activity (p < 0.01; n = 4) was also observed when naive CD4+CD45RO− T cells were tested in the MLR (Fig. 2⇑C). Generation of DCs in the presence of higher doses of alcohol (50 and 100 mM) also resulted in decreased allostimulatory activity compared with control DCs; however, this was not dose dependent (data not shown). When only T cells (and not DCs) were exposed to alcohol for 24 h before the MLR, alcohol failed to affect allostimulatory responses (data not shown). Our earlier data demonstrated that using stimulator cells (monocytes) from alcohol-consuming individuals and responder cells (T cells) from non-alcohol-consuming controls, T cell proliferation was reduced significantly. However, T cell proliferation was not decreased when responder cells (T cells) were obtained from alcohol-consuming individuals (9). This observation was consistent with our previous data that demonstrated no inhibition of PHA-induced T cell proliferation by alcohol (30). Thus, our subsequent experiments focused on the effects of alcohol on DC functions. Third, to investigate whether the low stimulatory potential of alcohol-exposed DCs was limited to alloantigen-induced T cell proliferation or represented a broader DC defect in Ag presentation capacity, we evaluated recall Ag (TT)-specific T cell responses. DCs were generated in the presence or absence of alcohol for 6 days, and then pulsed with TT (2 Lf/ml) overnight, and the Ag-presenting function of DCs was tested with autologous T cells as described earlier (7). The TT Ag-specific T cell proliferation was significantly decreased (p < 0.05; n = 5) in the presence of DCs generated with alcohol (25 mM) compared with control, non-alcohol-exposed DCs as APCs (Fig. 2⇑D). These results indicate that DCs generated in the presence of alcohol have impaired capacity to execute Ag-presenting function (uptake, processing, and presentation) to stimulate Ag-specific T cell responses. These findings are in agreement with earlier reports from our laboratory showing inhibition of Ag-specific T lymphocyte proliferation by alcohol-exposed human monocytes (7). Apoptosis is involved in activation-induced cell death, which is one of the mechanisms regulating immune reactions (31). Early in the apoptotic process, phosphatidylserine becomes exposed on the cell surface by flipping from the inner to the outer leaflet of the cytoplasmic membrane. Thus, early apoptotic cells are bound to annexin V via phosphatidylserine (32). Flow cytometric analysis of annexin V-stained DCs showed that control DCs had low apoptosis, and there was no significant difference in apoptosis between alcohol-exposed (annexin V-positive cells, 12.6 ± 2.3%) and control DCs (annexin V-positive cells, 15.3 ± 2.4%). The accessory function of DCs is largely determined by the presence of MHC class I, MHC class II, and costimulatory molecules that interact with T cell surface molecules to mediate activation signals (10, 11). Phenotypic marker analysis revealed characteristic features of day 7 iDCs, including decreased or undetectable CD14, CD3, CD19, and CD56 (data not shown), and strong expression of CD1a, HLA-DR, CD40, CD80 (B7.1), and CD86 (B7.2) compared with monocytes (Fig. 3⇓). The mean fluorescence intensity (MFI) for CD80 (MFI: normal iDCs, 462.9 ± 12.2; EtOH-iDCs, 406.5 ± 7.2; 15% decrease) and CD86 (MFI: normal iDCs, 536.9 ± 83.9; EtOH-iDCs, 435.9 ± 41.4; 18% decrease) in alcohol-treated cells showed a decreased trend (Fig. 3⇓A). However, we found that DCs generated in the presence of alcohol had significantly reduced expression of the costimulatory molecules CD80 (33% decrease) and CD86 (36% decrease) compared with non-alcohol-treated DCs (Fig. 3⇓B) (p < 0.01; n = 4). Further, expression of MHC class I and MHC class II molecules did not change in alcohol-treated DCs compared with control DCs (Fig. 3⇓A). Flow cytometric analysis of surface molecules on monocytes (MO), day 7 iDCs, and day 7 iDCs generated in the presence of 25 mM alcohol (EtOH-iDC). A, Monocytes, iDCs, and EtOH-DCs were stained with FITC- or PE-labeled specific Abs and analyzed by FACS. Results shown are representative of four donors with same results. B, Reduction of percent-positive CD80 and CD86 expression in alcohol-treated DCs. Myeloid DCs are major sources of inflammatory and immunoregulatory cytokines that determine the strength and/or the phenotypes of the T cell responses (10, 33). In this study, we evaluated the production of immunoregulatory cytokines, IL-12 (p40/70) and IL-10, by DCs generated in the presence or absence of alcohol as well as during the MLR. Consistent with the DC phenotype, IL-12 levels were higher in unstimulated 7-day iDCs compared with monocytes (Fig. 4⇓A). IL-10 levels showed an opposite pattern where DCs produced significantly lower levels of IL-10 than monocytes (Fig. 4⇓B). However, when DCs were generated in the presence of alcohol, we found increased IL-10 (p < 0.02; n = 5) and reduced IL-12 production (p < 0.05; n = 5) compared with non-alcohol-treated DCs. After stimulation with LPS for maximal induction of cytokines, alcohol-treated DCs continued to produce significantly higher levels of IL-10 compared with LPS-stimulated, non-alcohol-treated DCs (p < 0.001; n = 5) (Fig. 4⇓B). Additionally, LPS-stimulated, alcohol-treated DCs showed significantly lower levels of IL-12 (p < 0.05; n = 5) (Fig. 4⇓A). A and B, Alcohol decreases IL-12 (A) but increases IL-10 (B) levels. C and D, Addition of exogenous cytokines restores allogeneic MLR activity of alcohol-treated DCs (C), and blocking with anti-IL-10 Ab restores IL-12 levels in MLR supernatants of alcohol-treated DCs (D). A, Supernatants of day 7 iDCs in the presence or absence of LPS (100 ng/ml) for 18–20 h were subjected to IL-12 (p40/p70) estimation in an ELISA as described in Materials and Methods. Data are shown as mean (picograms per milliliter per 106 cells) ± SE of five donors. ∗, p < 0.05; ∗∗, p < 0.02. B, Supernatants from day 7 iDCs in the presence or absence of LPS (100 ng/ml) for 18–20 h were subjected to IL-10 estimation using an ELISA as described in Materials and Methods. Data are shown as mean (picograms per milliliter per 106 cells) ± SE of five donors. ∗, p < 0.02; ∗∗, p < 0.001. C, Day 7 iDCs generated in the absence (iDC) or presence of 25 mM alcohol (EtOH-iDC) were used as stimulator cells in an MLR. Anti-IL-10 neutralizing Ab (10 μg/ml), rat IgG1 isotype control, or human recombinant IL-12 (10 and 50 ng/ml) and IL-2 (50 U/ml) were added at the initiation of the 5-day MLR with responder T cells. T cell proliferation was measured as [3H]thymidine incorporation during the final 18 h of the 5-day assay. Results shown are mean counts per minute ± SE from four donors at the DC:T cell ratio of 1:10. ∗, p < 0.05; ∗∗, p < 0.02. D, Day 7 iDCs generated in the absence (iDC) or presence of 25 mM alcohol (EtOH-iDC) were used as stimulator cells in an MLR. Anti-IL-10 neutralizing Ab (10 μg/ml), rat IgG1 isotype control, or human rIL-12 (50 ng/ml) were added at the initiation of the 5-day MLR with responder T cells. Supernatants were collected after 48 h and estimated for IL-12 (p40/p70) in an ELISA as described in Materials and Methods. Data are shown as mean (picograms per milliliter) ± SE of six donors. ∗, p < 0.009; ∗∗, p < 0.005. Cytokine levels measured during the MLR reflect both T cell and APC cytokine production. We found reduced IL-12 and increased IL-10 production during the MLR with alcohol-treated DCs. Our data also showed significantly lower IL-2 levels (p < 0.03) in the presence of alcohol-treated DCs in the MLR consistent with the decreased T cell proliferation (Table I⇓). The functional role of the decreased IL-12, decreased IL-2, and increased IL-10 in the MLR with alcohol-treated DCs was further evaluated by exogenous modulation of these cytokines. Data in Fig. 4⇑C showed that the addition of human recombinant IL-12 and IL-2 restored the reduced allostimulatory capacity of alcohol-treated DCs in the MLR. These cytokines did not increase T cell proliferation with normal DCs in the MLR (data not shown). DC-derived IL-10 is a potent deactivating factor of APCs and prevents DC maturation in an autocrine manner (17, 34). Data in Fig. 4⇑C showed that anti-IL-10 Ab (35, 36) failed to restore the decreased T cell proliferation in the presence of alcohol-treated DCs. The isotype control Ab did not have any effect on the decreased allostimulatory activity. These results collectively suggested that the reduced alloantigen-induced T cell proliferation with alcohol-treated DCs can be ameliorated by IL-12 or IL-2 supplementation, but neutralization of IL-10 cannot restore full DC function during T cell activation. 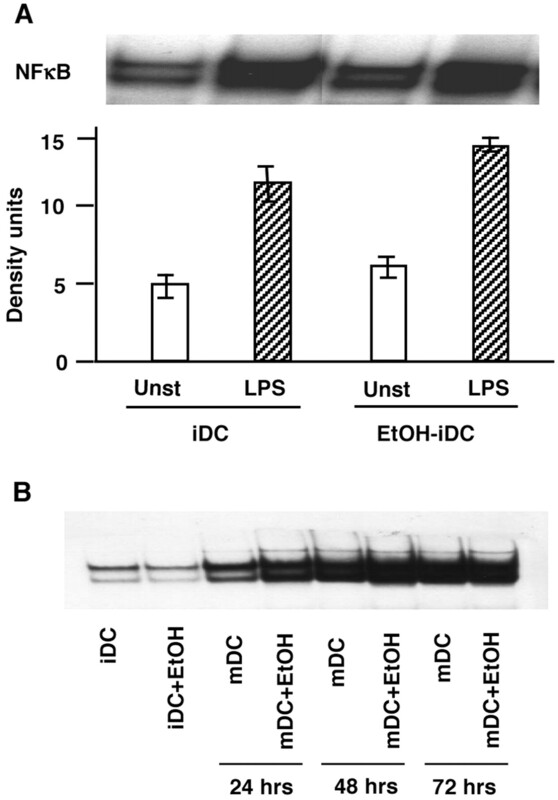 Endogenous IL-10 produced by DCs has been shown to attenuate IL-12 secretion (15). Therefore, neutralization of IL-10 should increase IL-12 production and, in turn, improve allostimulatory activity of alcohol-treated DCs. Although addition of anti-IL-10 Ab in MLR cultures of day 7 alcohol-treated DCs did not restore DC allostimulatory function (Fig. 4⇑C), we wanted to assess whether IL-12 levels were restored in the MLR of alcohol-treated DCs in the presence of anti-IL-10 Ab. Fig. 4⇑D shows that IL-12 levels are significantly increased (p < 0.005; n = 6) in MLR cultures of alcohol-treated DCs after addition of anti-IL-10 Ab without an increase in T cell proliferation (C). It must be noted here that IL-12 levels after anti-IL-10 Ab treatment were still much lower than the concentration of exogenous IL-12 that restored alloreactive T cell responses by alcohol-treated DCs in the MLR. We predict that alcohol may induce an inherent cellular defect during early DC differentiation that may impair responsiveness to low IL-12 after anti-IL-10 Ab and thus result in an inability to restore allostimulatory activity. The addition of a higher dose of recombinant IL-12 (a Th1 polarizing cytokine) and IL-2 to the MLR could directly influence T cell proliferation in the presence of alcohol-treated DCs (Fig. 4⇑C). Reversal of T cell proliferation by IL-12 (37) and IL-2 (38) may thus suggest that alcohol treatment induces T cell anergy. We examined the ability of alcohol-treated DCs to induce T cell anergy. Fig. 5⇓A demonstrates that naive CD4+ T cells primed with allogeneic normal DCs showed a vigorous response to the same donor-derived normal iDCs and mDCs. In contrast, the naive CD4+ T cells primed with alcohol-treated DCs were hyporesponsive to further stimulation with the same donor-derived normal iDCs and mDCs (Fig. 5⇓A). Evaluation of T cell apoptotic activity by annexin V/PI revealed no differences in T cell apoptosis due to interaction with alcohol-treated DCs (Fig. 5⇓B). 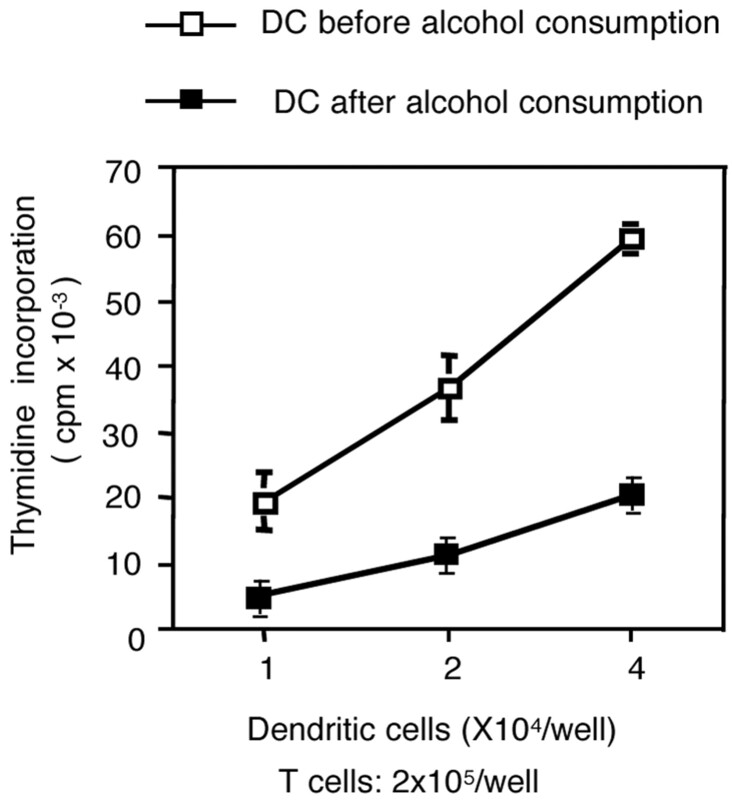 These results imply that alcohol may be responsible for induction of T cell anergy by “inhibitory” DCs. Cytokines such as IL-10 and IL-12 may play an important role in early stages of DC differentiation and induction of inhibitory DCs by alcohol. Alcohol induces T cell anergy (A), does not affect T cell apoptosis (B), and decreases T cell IFN-γ production that is restored by exogenous IL-12 (C). A, Human naive CD4+ T cells were cultured with allogeneic normal (iDCs) or alcohol DCs (EtOH-iDCs) for 3 days. These CD4+ T cells were then rescued, and T cells were subsequently restimulated with allogeneic normal iDCs generated from the same donor. The proliferative response was measured on day 5 by measuring the [3H]thymidine incorporation during the final 18 h. Results shown are mean counts per minute ± SE from four donors of the DC:T cell ratio of 1:10. ∗, #, Significance (p < 0.001) compared with the same proliferation groups in normal iDCs. B, Human naive CD4+ T cells were cultured with allogeneic normal (iDCs) or alcohol DCs (EtOH-iDCs) for 5 days and harvested. T cells alone (T) and T cells cocultured with normal DC (T-DC) or EtOH-DC (T-EtOH-DC) were stained with annexin V/PI as described in Materials and Methods. Representative result from a total of three donors is shown as percent annexin V/PI+ cells. C, Human naive CD4+ T cells were cocultured with allogeneic normal or EtOH-DCs for 3 days in the presence or absence of human rIL-12 (0.5, 10, and 50 ng/ml). CD4+ T cells were rescued on day 3 of the MLR, and T cells were subsequently restimulated with immobilized CD3 and soluble CD28 (1 μg/ml) to induce IFN-γ production. Supernatants were collected after 24 h and estimated for IFN-γ in an ELISA as described in Materials and Methods. Data are shown as mean (picograms per milliliter) ± SE of six donors. ∗, p < 0.002. To further determine whether alcohol affected Th1 responses, we evaluated the capacity of IFN-γ production by CD4+ T cells primed with alcohol-treated DCs. Day 3 T cells were harvested from cocultures of alcohol-treated DCs with naive CD4+ T cells and stimulated with immobilized CD3 and soluble CD28 (1 μg/ml) to induce IFN-γ production. Fig. 5⇑C shows a significant decrease (p < 0.002; n = 6) in T cell IFN-γ production when primed with alcohol-treated DCs compared with normal DCs. Furthermore, addition of rIL-12 during coculture restored T cell IFN-γ production, indicating that alcohol directly suppresses Th1 activity (Fig. 5⇑C). Although iDCs are superior in Ag uptake, mDCs are most effective in T cell activation (39). DC maturation was induced in vitro by the addition of LPS (100 ng/ml) to iDCs on day 5 for 72 h (40, 41). Maturation of DCs was characterized by an increase in CD83 expression (Fig. 6⇓A) (MFI: normal mDCs, 467.7 ± 36.8; EtOH-mDCs, 459.7 ± 32.5) and increased allostimulatory capacity compared with iDCs (p < 0.001; n = 10) (Fig. 6⇓B). However, the allostimulatory capacity of mDCs generated in the presence of alcohol was significantly reduced (p < 0.01; n = 10) compared with normal mDCs. Thus, LPS-induced DC maturation could only partially restore the allostimulatory defects of DCs differentiated in the presence of alcohol. Interestingly, addition of alcohol to iDCs only for the duration of the LPS-induced maturation phase failed to inhibit the allostimulatory capacity of mDCs (Fig. 6⇓C), suggesting that alcohol inhibited DC differentiation rather than just the maturation. Alcohol affects differentiation but not maturation of DCs as determined by CD83 expression (A), allostimulatory capacity of mDCs generated in the presence of alcohol (B), and allogeneic MLR activity of DCs matured in the presence of alcohol (C). A, DCs were generated in the presence or absence of 25 mM alcohol and DC maturation was induced by addition of LPS (100 ng/ml) to iDCs on day 5 for 72 h. mDC in the presence (EtOH-mDC) and absence (mDC) of alcohol was evaluated for CD83 expression by flow cytometric analysis as described in Materials and Methods. B, DC maturation was induced by addition of LPS (100 ng/ml) to iDCs (I-DC) cultivated in the presence (EtOH-mDC) or absence (mDC) of 25 mM alcohol on day 5 for 72 h. Day 8 mDCs were used as stimulatory cells in a 5-day MLR with responder T cells. Allogeneic stimulatory activity was detected as [3H]thymidine incorporation during the final 18 h of the 5-day MLR. Results are expressed as counts per minute ± SE from 10 experiments. ∗, p < 0.01. C, Maturation of DCs was induced by addition of LPS (100 ng/ml) to iDCs on day 5 for 72 h in the presence (EtOH-mDC added during maturation) or absence (mDC) of 25 mM alcohol and used as stimulator cells in a 5-day MLR. T cell proliferation was measured as [3H]thymidine incorporation during the final 18 h of the 5-day assay. Results are expressed as counts per minute ± SE from four experiments. It has been shown that effective Ag presentation by DCs is NFκB dependent, and that induction of NFκB activity during DC maturation is essential for proper DC function (42). Earlier studies from our laboratory showed inhibition of NFκB activation by acute alcohol (25 mM) in monocytes (27, 43). In this study, alcohol-treated DCs exhibited a lack of the ability to reach complete maturation with LPS. Thus, we tested whether alcohol affected NFκB activation in DCs. Day 5 iDCs generated in the presence or absence of alcohol were stimulated with LPS for 1, 24, 48, and 72 h (for the entire time of DC maturation) and then subjected to EMSA. To our surprise, we found no changes in NFκB DNA binding activity between DCs generated in the presence or absence of alcohol (Fig. 7⇓), suggesting that alcohol does not affect NFκB DNA binding and hence maturation of DCs. Alcohol does not affect NFκB binding in DCs. Day 7 iDCs generated in the presence (EtOH-DC) or absence (DC) of 25 mM alcohol were stimulated with LPS (100 ng/ml) for 1, 24, 48, and 72 h, and then subjected to nuclear extraction and EMSA as described in Materials and Methods. Results expressed are one representative gel of a total of four experiments performed. APC defects appear to be pivotal in the alcohol-induced alterations of cell-mediated immunity and in decreased Ag-specific T cell proliferation. Previous studies demonstrated suppressive effects of alcohol on Ag-presenting function of monocytes (7, 8). DCs are the most potent APCs that activate naive T cells (10). In this study, we report that alcohol consumption by healthy, nonalcoholic individuals significantly reduced DC allostimulatory capacity and T cell activation. To the best of our knowledge, this is also the first study to report that a physiologically relevant concentration of alcohol in vitro decreases allostimulatory capacity of monocyte-derived DCs and induces T cell anergy. DCs are highly specialized APCs of the immune system. Fully mature DCs are potent activators of naive T cells and are regarded as important initiators of primary Th1 responses. We report that alcohol affects DC precursors, monocytes, and their differentiation and full maturation to DCs, and results in DCs differentiating into an inhibitory phenotype by a mechanism that involves decreased IL-12 and increased IL-10 production. Our results showed that alcohol-treated DCs induce T cell anergy and inhibition of Th1 responses. Alcohol also significantly affects allostimulatory capacity of already-differentiated iDCs in vitro. Production of cytokines such as IL-10 and IL-12 by DCs can influence DC induction of a Th1 or Th2 immune response. In addition to expressing high levels of Ag-presenting and costimulatory molecules, DCs release large amounts of IL-12 that can stimulate preferential Th1 immune responses (44). However, release of IL-10 blocks the DC maturation process by interfering with the up-regulation of costimulatory molecules and production of IL-12, subsequently limiting the ability of DCs to initiate a Th1 response (45, 46). Cellular immunity is impaired by both acute and chronic alcohol use, leading to induction of Th2 responses (47). Our data suggest inhibition of Th1-type immune activation by alcohol-treated DCs that produced significantly lower amounts of IL-12 (p40/70) and resulted in reduced IFN-γ production by T cells after coculture. Furthermore, our data demonstrated that alcohol-treated DCs are capable of inducing CD4+ T cell anergy in vitro. Addition of exogenous IL-12 and IL-2 completely restored T cell proliferation with alcohol-treated DCs, indicating that these cytokines could reverse the anergic state of CD4+ T cells (37, 38). Furthermore, we found that naive CD4+ T cells cocultured with alcohol-treated DCs produced significantly lower amounts of IFN-γ compared with CD4+ T cells cocultured with normal DCs, and addition of rIL-12 to MLR cultures of alcohol-treated DCs restored T cell IFN-γ levels. Collectively, these results suggested that alcohol can induce CD4+ T cell anergy and inhibit Th1 responses, and that exogenous cytokines such as IL-12 and IL-2 are capable of reversing this anergic state. Restoration of decreased Th1 immune responses by IL-12 after chronic alcohol feeding was reported earlier in mice (28). The mechanism by which alcohol reduces IL-12 in DCs is yet to be elucidated. We speculate that alcohol may augment IL-10 production at the early stages of differentiation and, in turn, result in diminished IL-12 production. DCs have been shown to secrete more IL-12 at earlier stages of maturation, influencing in vivo migration of DCs to lymphoid organs and terminal maturation (48). Therefore, diminished IL-12 could influence DC differentiation, maturation, and function. Alcohol-treated DCs exhibited significantly higher IL-10 levels at baseline and after LPS stimulation compared with normal DCs. However, neutralization of IL-10 in the MLR increased IL-12 levels but did not restore the reduced T cell proliferation with alcohol-treated DCs. This suggested that restoration of IL-12 after blocking IL-10 in the MLR cannot overcome the inherent defect induced by alcohol during early DC differentiation. Furthermore, the increased IL-10 production observed during DC differentiation along with reduced CD80/CD86 expression in alcohol-treated DCs are consistent with the DC phenotype previously described as inhibitory DCs (24). Alcohol exposure retained the morphology as well as expression of most surface markers of iDCs and mDCs. However, the expression of costimulatory molecules CD80 and CD86 was somewhat reduced by alcohol. The importance of the CD86-CD28 system in T cell responses has been well documented (49). Moreover, it has been reported that T cell anergy is induced by the lack of functional CD80/CD86-CD28 signaling that can be reversed with exogenous IL-2 (50). In agreement with those reports, IL-2 improved allostimulatory capacity of alcohol-treated DCs in the MLR. Decreased expression of CD80/CD86 on alcohol-exposed DCs may contribute, although to a lesser extent, to decreased T cell proliferation due to inefficient costimulatory signals provided by the CD80/CD86-CD28 interaction. Furthermore, the reduced expression of CD80/CD86 can lead to a DC phenotype that induces T cell anergy rather than proliferation (50). Converting from an Ag-capturing to an Ag-presenting mode is defined as DC maturation, and this is pivotal in the initiation of immunity (10, 11). Our data showed decreased Ag-presenting function of LPS-matured, alcohol-treated DCs compared with normal LPS-matured DCs. We found only partial restoration of allostimulatory activity after maturation of alcohol-treated DCs to the level of iDCs, suggesting that DC maturation cannot overcome the inhibitory effects of alcohol during differentiation. Alcohol added on day 5 to immature control DCs along with LPS did not have any effect on the allostimulatory function, suggesting that alcohol affects DC differentiation rather than the maturation process. This notion was also supported by the equally sufficient induction of the CD83, a DC maturation marker on alcohol-treated DCs compared with controls. An important mechanism that contributes to the Ag-presenting function of mDCs is the induction of NFκB (42). Activated NFκB in the nucleus is a regulator of DC maturation, and it is essential in DC Ag presentation (42). In fact, NFκB now is considered as a target for blocking Ag presentation for therapeutical purposes in various medical conditions, such as transplantation, allergy, and autoimmunity (42, 51). Our previous data showed a down-regulatory effect of acute alcohol exposure on monocyte NFκB activation that may contribute to its decreased inflammatory cytokine production and hence immunosuppression after alcohol use (27, 43). However, alcohol-treated DCs failed to show any changes in NFκB activation, indicating that alcohol affects NFκB in immune cells depending on the stage of their differentiation. Inability to alter NFκB activity in DCs indicates the effect of alcohol on DC differentiation at an earlier stage rather than on the terminal maturation phase. Alcohol may thus regulate Ag-presenting function of DCs by affecting their differentiation and not maturation. In summary, our studies suggested that the stimulatory potential of alcohol-treated DCs is impaired against both alloantigens and recall Ags. Alcohol induces an inhibitory DC phenotype, and thus results in CD4+ T cell anergy and inhibition of Th1 responses. The generation of a defective DC by alcohol may be attributed to increased IL-10 and reduced IL-12 production. Th1 responses could be restored by addition of IL-12, indicating an important role for this cytokine. Furthermore, alcohol did not affect maturation of DCs but primarily regulated differentiation. Our findings may thus shed light on the role of DCs in the modulation of immune functions by alcohol. ↵1 This work was supported by Public Health Service Grant AA08577 from the National Institute of Alcohol Abuse and Alcoholism, and used resources of the Diabetes Endocrinology Research Center Grant 5 P30 DK32520 from the National Institute of Diabetes and Digestive and Kidney Diseases. ↵2 The contents of this work are solely the responsibility of the authors and do not necessarily represent the official views of the National Institute of Alcohol Abuse and Alcoholism. ↵4 Abbreviations used in this paper: TT, tetanus toxoid; DC, dendritic cell; iDC, immature DC; mDC, mature DC; EtOH, ethanol; PI, propidium iodide; MFI, mean fluorescence intensity. Jerrells, T. R., D. Sibley. 1996. Effects of ethanol on T-cell-mediated immunity to infectious agents. H. Friedman, and T. W. Klein, and S. Specter, eds. Drugs of Abuse, Immunity and Infections 129. CRC, Boca Raton, FL. Waltenbaugh, C., K. Vasquez, J. D. Peterson. 1998. Alcohol consumption alters antigen-specific Th1 responses: mechanisms of deficit and repair. Alcohol. Clin. Exp. Res. 22:220S. Ben-Eliyahu, S., G. G. Page, R. Yirmiya, A. N. Taylor. 1996. Acute alcohol intoxication suppresses natural killer cell activity and promotes tumor metastasis. Nat. Med. 2:457. Wiley, T., M. McCarthy, L. Breid, M. McCarthy, T. Layden. 1998. Impact of alcohol on the histological and clinical progression of hepatitis C infection. Hepatology 28:805. McClain, C., S. Barve, I. Deaciuc, M. Kugelmas, D. Hill. 1999. Cytokines in alcoholic liver disease. Semin. Liver Dis. 19:205. Nelson, S., J. Kolls. 2002. Alcohol, host defense and society. Nat. Rev. Immunol. 2:205. Szabo, G., B. Verma, D. Catalano. 1993. Selective inhibition of antigen-specific T lymphocyte proliferation by acute ethanol exposure: the role of impaired monocyte antigen presentation capacity and mediator production. J. Leukocyte Biol. 54:534. Szabo, G., P. Mandrekar, D. Catalano. 1995. Inhibition of superantigen-induced T cell proliferation and monocyte IL-1β, TNF-α, and IL-6 production by acute ethanol treatment. J. Leukocyte Biol. 58:342. Szabo, G., P. Mandrekar, A. Dolganiuc, D. Catalano, K. Kodys. 2001. Reduced alloreactive T-cell activation after alcohol intake is due to impaired monocyte accessory cell function and correlates with elevated IL-10, IL-13, and decreased IFN-γ levels. Alcohol. Clin. Exp. Res. 25:1766. Steinman, R., K. Inaba. 1999. Myeloid dendritic cells. J. Leukocyte Biol. 66:205. Palucka, K., N. Taquet, F. Sanchez-Chapuis, J. C. Glukman. 1998. Dendritic cells as the terminal stage of monocyte differentiation. J. Immunol. 160:4587. Chapius, F., M. Rosenzwajg, M. Yagello, M. Ekman, P. Biberfeld, J. Gluckman. 1997. Differentiation of human dendritic cells from monocytes in vitro. Eur. J. Immunol. 27:431. Zhou, L., T. Tedder. 1996. CD14+ blood monocytes can differentiate into functionally mature CD83+ dendritic cells. Proc. Natl. Acad. Sci. USA 93:2588. Heufler, C., F. Koch, U. Stanzl, G. Topar, M. Wysocka, G. Trinchieri, A. Enk, R. Steinman, N. Romani, G. Schuler. 1996. Interleukin-12 is produced by dendritic cells and mediates T helper 1 development as well as interferon-γ production by T helper 1 cells. Eur. J. Immunol. 26:659. Xia, C.-Q., K. J. Kao. 2003. 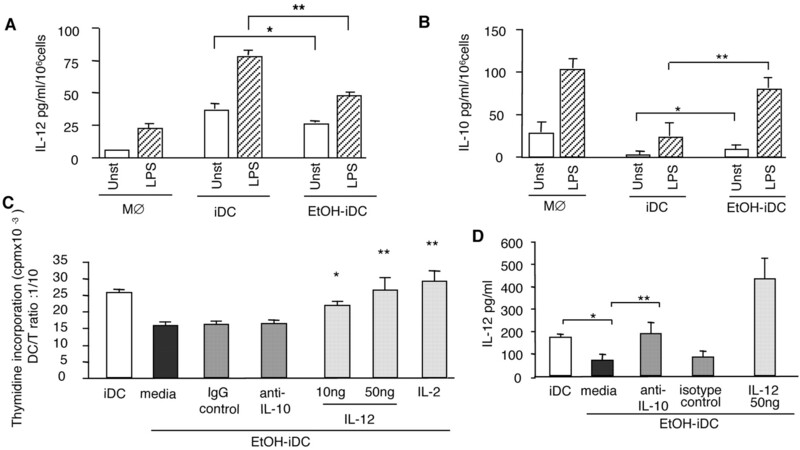 Suppression of interleukin-12 production through endogenously secreted interleukin-10 in activated dendritic cells: involvement of activation of extracellular signal protein kinase. Scand. J. Immunol. 58:23. De Smedt, T., M. Van Mechelen, G. De Becker, J. Urbain, O. Leo, M. Moser. 1997. Effect of interleukin-10 on dendritic cell maturation and function. Eur. J. Immunol. 27:1229. Corinti, S., C. Albanesi, A. la Sala, S. Pastore, G. Girolomoni. 2001. Regulatory activity of autocrine IL-10 on dendritic cell functions. J. Immunol. 166:4312. Mandrekar, P., D. Catalano, L. Girouard, G. Szabo. 1996. Human monocyte IL-10 production is increased by acute ethanol treatment. Cytokine 8:567. Onji, M., F. Akbar, N. Horiike. 2001. Dendritic cell based immunotherapy for hepatocellular carcinoma. J. Gastroenterol. 36:794. Tatsumi, T., T. Takehara, T. Kanto, T. Miyagi, N. Kuzushita, Y. Sugimoto, M. Jinushi, A. Kasahara, Y. Sasaki, M. Hori, N. Hayashi. 2001. Administration of interleukin-12 enhances the therapeutic efficacy of dendritic cell-based tumor vaccines in mouse hepatocellular carcinoma. Cancer Res. 61:7563. Ewing, J. A.. 1984. Detecting alcoholism: the CAGE questionnaire. J. Am. Med. Assoc. 252:1095. Bender, A., M. Sapp, G. Schuler, R. Steinman, N. Bhardwaj. 1996. Improved methods for the generation of dendritic cells from nonproliferating progenitors in human blood. J. Immunol. Methods 196:121. Romani, N., D. Reidder, M. Heuer, S. Ebner, E. Kampgen, B. Eibl, D. Niederweiser, G. Schuler. 1996. Generation of mature dendritic cells from human blood: an improved method with special regard to clinical applicability. J. Immunol. Methods 196:137. Sato, K., N. Yamashita, M. Baba, T. Matsuyama. 2003. Modified myeloid dendritic cells act as regulatory dendritic cells to induce anergic and regulatory T cells. Blood 101:3581. Szabo, G., C. Gavala, P. Mandrekar. 2001. 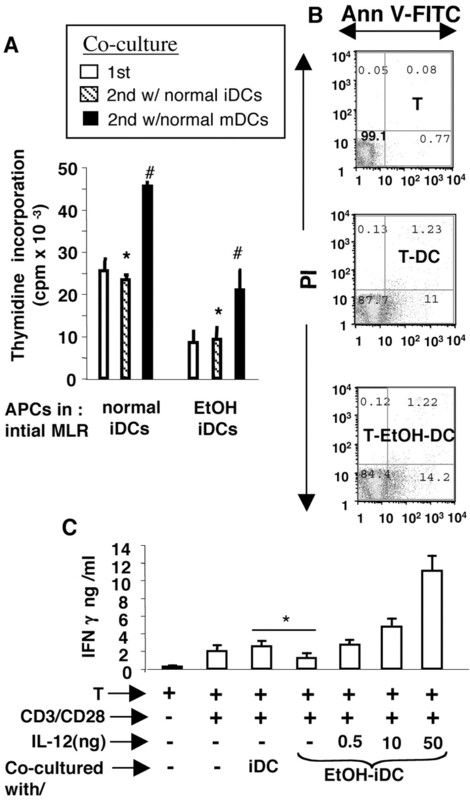 Tacrolimus and cyclosporine A inhibit allostimulatory capacity and cytokine production of human myeloid dendritic cells. J. Invest. Med. 49:442. Schatzle, J. D., J. Kralova, J. Bose, H.R. . 1995. Avian IκBα is transcriptionally induced by c-rel and v-rel with different kinetics. J. Virol. 69:5383. Mandrekar, P., D. Catalano, G. Szabo. 1999. Inhibition of lipopolysaccharide-mediated NFκB activation by ethanol in human monocytes. Int. Immunol. 11:1781. Peterson, J., K. Vasquez, C. Waltenbaugh. 1998. IL-12 therapy restores cell-mediated immunity in ethanol consuming mice. Alcohol. Clin. Exp. Res. 22:245. Szabo, G., S. Chavan, P. Mandrekar, D. Catalano. 1998. Acute alcohol consumption attenuates interleukin-8 (IL-8) and monocyte chemoattractant peptide-1 (MCP-1) induction in response to ex vivo stimulation. J. Clin. Immunol. 19:67. Verma, B. K., M. Fogarasi, G. Szabo. 1993. Down-regulation of TNFα activity by acute ethanol treatment in human peripheral blood monocytes. J. Clin. Immunol. 13:8. Sun, E. W., Y. F. Shi. 2001. Apoptosis: the quiet death silences the immune system. Pharmacol. Ther. 92:135. Van Engeland, M., L. Nieland, F. Ramaekers, B. Schutre, C. Reutelingsperger. 1998. Annexin V-affinity assay: a review on an apoptosis detection system based on phosphatidylserine exposure. Cytometry 31:1. Lanzavecchia, A., F. Sallusto. 2001. The instructive role of dendritic cells on T cell responses: lineages, plasticity and kinetics. Curr. Opin. Immunol. 13:291. Buelens, C., V. Verhasselt, D. DeGroote, K. Thielemans, M. Goldman, F. Willems. 1997. Inetrleukin-10 prevents the generation of dendritic cells from human peripheral blood mononuclear cells cultured with interleukin-4 and granulocyte/macrophage colony stimulating factor. Eur. J. Immunol. 27:756. Kanto, T., N. Hayashi, T. Takehara, T. Tatsumi, N. Kuzushita, A. Ito, Y. Sasaki, A. Kasahara, M. Hori. 1999. Impaired allostimulatory capacity of peripheral blood dendritic cells recovered from hepatitis C virus-infected individuals. J. Immunol. 162:5584. Abrams, J. S., M. G. Roncarolo, H. Yssel, U. Andersson, G. J. Gleich, J. E. Silver. 1992. Strategies of anti-cytokine monoclonal antibody development: immunoassay of IL-10 and IL-5 in clinical samples. Immunol. Rev. 127:5. Grohmann, U., R. Bianchi, E. Ayroldi, M. L. Belladonna, D. Surace, M. C. Fioretti, P. Puccetti. 1997. A tumor-associated and self antigen peptide presented by dendritic cells may induce T cell anergy in vivo, but IL-12 can prevent or revert the anergic state. J. Immunol. 158:3593. Essery, G., M. Feldmann, J. R. Lamb. 1988. Interleukin-2 can prevent and reverse antigen-induced unresponsiveness in cloned human T lymphocytes. Immunology 64:413. Rescigno, M., M. Martino, C. Sutherland, M. Gold, P. Ricciardi-Castagnoli. 1998. Dendritic cell survival and maturation are regulated by different signaling pathways. J. Exp. Med. 188:2175. DeSmedt, T., B. Pajak, L. Muraille, E. Lespagnard, E. Heinen, P. DeBaetselier, J. Urbain, O. Leo, M. Moser. 1996. Regulation of dendritic cell numbers and maturation by lipopolysaccharide in vivo. J. Exp. Med. 184:1413. Winzler, C., P. Rovere, M. Rescigno, F. Granucci, G. Penna, L. Adorini, V. S. Zimmerman, J. Davoust, P. Ricciardi-Castagnoli. 1997. Maturation stages of mouse dendritic cells in growth factor dependent long-term cultures. J. Exp. Med. 185:317. Yoshimura, S., J. Bondeson, B. Foxwell, F. Brennan, M. Feldmann. 2001. Effective antigen presentation by dendritic cells is NF-κB dependent: coordinate regulation of MHC, co-stimulatory molecules and cytokines. Int. Immunol. 13:675. Mandrekar, P., D. Catalano, G. Szabo. 1997. Alcohol-induced regulation of nuclear regulatory factor-κβ in human monocytes. Alcohol. Clin. Exp. Res. 21:988. Macatonia, S., N. Hosken, M. Litton, P. Veiera, C. Hsieh, J. Culpepper, M. Wysocka, G. Trincheiri, K. Murphy, A. O’Garra. 1995. 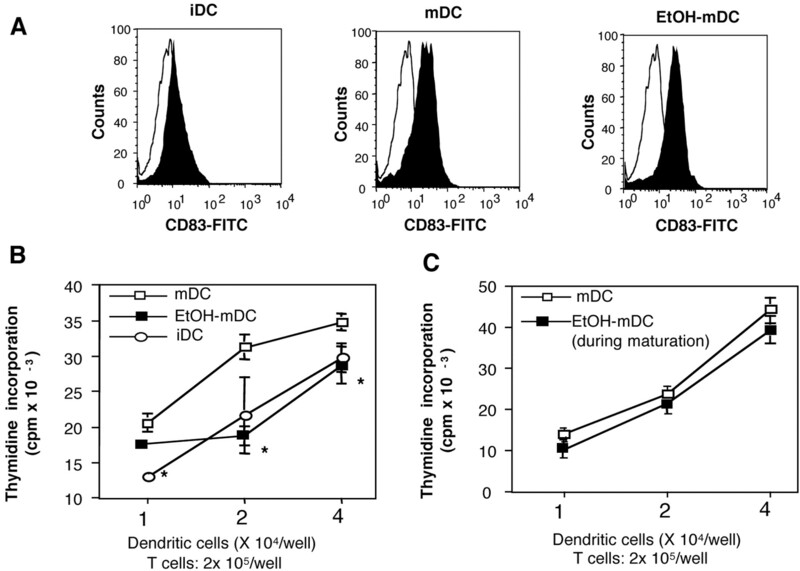 Dendritic cells produce IL-12 and direct the development of Th1 cells from naive CD4+ T cells. J. Immunol. 154:5071. Igeitseme, J., G. Ananaba, J. Bolier, S. Bowers, T. Moore, T. Belay, F. O. Eko, D. Lyn, C. Black. 2000. Suppression of endogenous IL-10 gene expression in dendritic cells enhances antigen presentation for specific Th1 induction: potential cellular vaccine development. J. Immunol. 164:4212. McBride, J., T. Jung, J. deVries, G. Aversa. 2002. IL-10 alters DC function via modulation of cell surface molecules resulting in impaired T cell responses. Cell. Immunol. 215:162. Latif, O., J. Peterson, C. Waltenbaugh. 2002. Alcohol-mediated polarization of type 1 and type 2 immune responses. Front. Biosci. 7:a135. Kalinski, P., J. H. N. Schuitemaker, C. M. U. Hilkens, E. A. Wierenga, M. L. Kapsenberg. 1999. Final maturation of dendritic cells is associated with impaired responsiveness to IFNγ and to bacterial IL-12 inducers: decreased ability of mature dendritic cells to produce IL-12 during the interaction with Th cells. J. Immunol. 162:3231. Coyle, A. J., J. C. Gutierrez-Ramos. 2001. The expanding B7 superfamily: increasing complexity in costimulatory signals regulating T cell function. Nat. Immunol. 2:203. Corrigall, V., E. Solau-Gervais, G. Panayi. 2000. Lack of CD80 expression by fibroblast-like synoviocytes leading to anergy in T lymphocytes. Arthritis Rheum. 43:1606. Yoshimura, S., J. Bondeson, F. Brennan, B. Foxwell, M. Feldmann. 2001. Role of NFκB in antigen presentation and development of regulatory T cells elucidated by treatment of dendritic cells with the proteasome inhibitor PSI. Eur. J. Immunol. 31:1883.